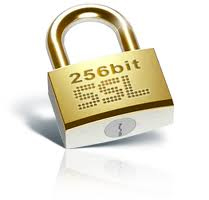 SSL (Secure Socket Layer) is a cryptographic protocol encrypted with 128 or 256 bit key that provides secure connection between a browser and a server (where your web site is hosted). How SSL works – any data sent between the browser and your website is encrypted before sending and then decrypted after being received with this 128 or 256 bit key issued especially for you. The SSL protocol uses digital certificates to create a secure, confidential communications "pipe" between two entities. Data transmitted over an SSL connection cannot be tampered with or forged easily. An SSL Web server certificate authenticates the identity of a website to browser users and enables encrypted communications using SSL. When a browser user wants to send confidential information to a Web server, the browser will access the server's digital certificate and obtain its public key to encrypt the data. A SSL certificate is issued by a Trusted Authority. Since the Web server is the only party with access to its private key, only the server can decrypt the information. This is how the information remains confidential and tamper-proof while in transit across the Internet. SSL Certificate helps consumers and businesses be more confident and responsible when submitting personal details over a website. For example, if you sell something online and you process credit card information or other confidential information, then you have to use SSL encryption for the data exchanged between a client on your website and the server hosting your site. Data sent via a SSL connection is protected by encryption (128 or 256 bit key), a mechanism that prevents eavesdropping and tampering with the transmitted information.